Where to buy quality Japanese green tea? We get you started with five online tea shops. The first step is to know what you are looking for. Japanese tea vocabulary is completely different from Chinese tea. You need to learn what types of tea are available, where the best comes from, and what makes them special. For example, did you know the first harvest in spring is considered the best? When it comes to buying Japanese green tea online, time spent researching is time well-spent, because it helps you recognize a quality product when you see one. The next step is to examine the websites. Read the descriptions to learn about the tea. Check out the customer reviews. Customer reviews can tell you a great deal about the type of tea you are planning to buy. For example, they may describe to you the flavors or the ease of brewing. Some reviewers will even give instructions on how to brew the tea to get the best flavor, based on their own experiences. If you can't find credible customer reviews, try Googling to see if you can uncover reviews on other sites. Alternatively, ask around on tea-related forums or other online groups to see if you can find someone who has ordered from the website recently. Does it have helpful, detailed information on the product it is selling? Does it give instructions on how to brew tea? Does it have articles on how Japanese tea is grown and processed? Does it appear to have been created by someone knowledgeable? When were they harvested? Were they the first harvest of the year, the second, the third or even the fourth? When and how were they packaged? Remember, quality goes down with each additional harvest, so if the website does not say which harvest the tea came from, it may be because they do not want you to know. Also, Japanese green tea is at its best when it is relatively fresh, so be wary of websites that do not tell you the packaging date. You certainly do not want to spend your money on a product that has gone stale in a warehouse somewhere! Finally, make sure that the tea you purchase was grown, harvested and processed inside Japan. China exports lots of tea to Japan these days. If it is your first time, you may want to order smaller sample sizes. After all, if you like the tea, you can always go back for more! 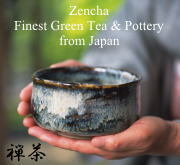 Zencha ships green tea directly from tea gardens in Shizuoka, Yame, Uji Kyoto and exquisite pottery worldwide directly from Japan. We ship the finest Sencha & Gyokuro from the most reputable tea growing regions from Shizuoka in the north to Kyushu in the south, along with the wide selection of Hagi ware, which has been loved by tea master for over 400 years. I also recommend the Premium Sencha Takumi from Yame and the Shizu-no-ten from Shizuoka. Japanese consumers are famous for being especially conscious about quality. This is particularly true concerning their favorite beverage, green tea. Today, almost half of all the green tea consumed in Japan is grown in Shizuoka Prefecture. And if asked, most Japanese will immediately answer that the best Japanese green tea comes from Shizuoka. Shizuokatea offers premium tea products sourced exclusively from the Shizuoka region. Once many tea drinkers try authentic Shizuoka Green Tea, they seldom return to others. O-Cha.com is another Japan-based tea shop that has good customer reviews on and off their site. You can learn a lot about green tea from their website. If you want to order somewhere closer to home, Chado Tea House is a good choice. Based in Canada, they specialize in tea imported directly from the Shizuoka region of Japan. 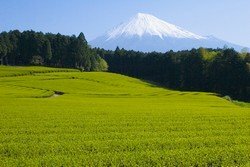 Shizuoka is well known for its quality and it is the largest producer of green tea consumed in Japan. We purchase directly from a Japanese tea producer so we can offer you the highest quality products at reasonable prices. All of our organic tea products satisfy the highest standard set by JAS and JONA. In order to be certified organic tea leaves are grown from a certified organic farm and processed at a facility used exclusively for organic products. Genuine Matcha and Japanese green tea are directly delivered anywhere around the world from Japan.